Zompires! Technically, the baddies in The Remaining are victims of a plague, presumably some sort of super-strain of bacteria that's resistant to antibiotics and creates an insatiable hunger for living flesh in those infected by it, but even though they might still be alive, their initial characteristics are an intriguing mix of zombie and vampire menace. I say "initial" because in some ways one senses author D.J. Molles moving in an I Am Legend or The Girl with All the Gifts direction, dropping hints quite early in the book that there may be more to the infected than mere murderous hunger. The Remaining is at its best when describing protagonist Lee's first contacts with the infected, as he quickly learns he's facing less the shambling corpses of Night of the Living Dead than the ferocious, near-unstoppable sprinting horrors of 28 Days Later. So horrible are they that human civilization is pretty much entirely destroyed in about a month, as people (and not only the infected) start tearing each other apart, often literally. Where the story is markedly less successful is in the other half of the premise: that the U.S. government had prepared for the apocalypse by selecting 48 of the most psychologically resilient soldiers they could find and sending them into little bunkers whenever there was a potentially civilization-ending threat, and telling them to wait a month (if they got no 'all clear' message, that is) and then emerge to aid groups of survivors in rebuilding. If, when reading this paragraph, you started out by nodding your head, but gradually found yourself shaking it in puzzlement by the end, you and I are on the same page. In a word...wuuuuut? Moreover, as Lee struggles to make sense of the new post-apocalyptic reality, his trademark resilience (which I took, apparently wrongly, to mean the ability to make wise decisions and not crumble under pressure) epically fails him time and time again. Indeed, he makes so many utterly inane decisions (my favorite was leaving a preteen refugee in his precious bunker before leaving on an incredibly risky mission, then acting all surprised when he comes back to find the place a gutted ruin) one has to wonder what on earth he did to qualify for the elite government program that landed him in said bunker. Worst of all, there's a deeply troubling current of misogyny running through the story. Finally, the male survivalist type characters like Lee and eventual comrade Jack (and, perhaps, the author himself) seem to be saying, a world where men can be men, and can just shoot guns and make fun of women for not knowing about them! In fact, the only female character of any significance in this, the first book in the series, is immediately shunted into a nurturing role, looking after the two kids (one of whom, admittedly, is her own) and contemptuously denied access to the all-male arena of combat (she claims she can help the two macho men as they prepare to do battle, only to be openly mocked, then derisively tossed a shotgun and told to stay with the kids where she belongs). I have no idea what qualifies Lee (or Jack) to make these snarky comments, especially with Lee's astonishingly bad track record of decisions while playing Cops and Zombies, but my interest waned all too rapidly when "the men" started talking this way. All in all, The Remaining has at its core a mildly intriguing premise, but it is rather poorly realized. The characters are mere archetypes, the protagonist lacks charisma and just seems shockingly dumb, and the female character (yes, the singular is intentional here) is present only to mind the kids (and, in the sequels, presumably become a sexual conquest for the unlikable Lee). Does all this add up to me being interested in reading the sequel? I never thought I'd say this of any post-apocalyptic zompire story with echoes of I Am Legend, but my answer is "not so much." Nerd coefficient: 4/10 "not very good"
This was a public service announcement by Zhaoyun, sf/f aficionado and Nerds of a Feather stalwart since early 2013. Molles, D.J. 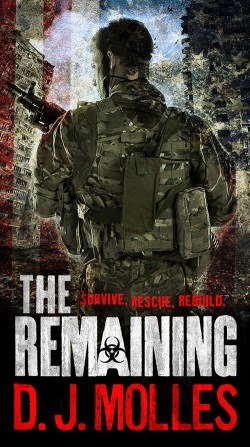 The Remaining. Orbit: 2014.